We delve deep into the history of one of Scotland's most famous spirits brands. Hendrick’s Gin. Curious. Unusual. Peculiar. Cucumber. Premium. Innovative. Bold. Unique. Quality. Brave. Scottish. Some may find that last word a revelation. Scottish? What might come as more of a revelation to many is that next year Hendrick’s Gin will officially celebrate its twentieth birthday. Considered to be the forefather of Scottish Gin, we delve deep into the history of Hendrick’s. We explore the key dates, events, places and people from the last 120 years who have played a role in the History of Hendrick’s. William Grant & Sons, the Scottish distillers and business behind Hendrick’s Gin, is one of Scotland’s oldest family owned distillers established in 1886 by William Grant; a date that can be seen on the Hendrick’s label. To understand where Hendrick’s Gin is going, first we’re going to look at where it’s been. It’s a tale that involves travelling back over 120 years to the birth of a distillery and a Scottish business that would shape, change and influence the world of spirits forever. The Grant family came to reside in Speyside thanks to Alexander Grant. Alexander was one of only three brothers who survived the famous Battle of Culloden in 1745 and after the battle he was forced to flee to Banffshire where he was hidden by a clan chief. Eventually he was awarded land for ‘services to the King’ and put down roots in Speyside. Alexander’s great, great grandson William Grant was born on the 18th of December 1839 in Dufftown, a place now famous for its whisky. From the age of 7, William spent his summers herding cattle and winters helping out on the farm and attending the local school. With his roots in Speyside, and a decent education, he left school and started work as a trainee shoemaker. 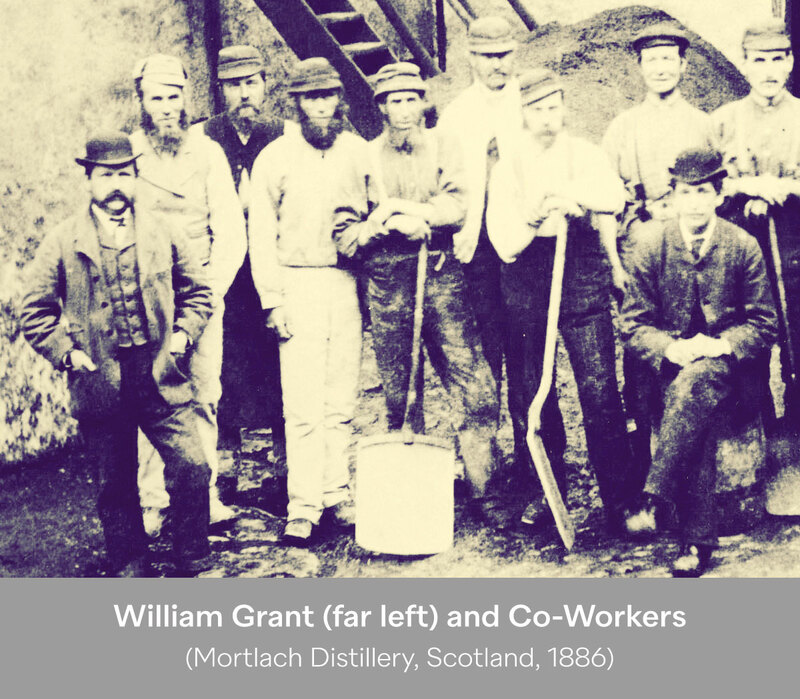 In 1866, William sought employment as a bookkeeper at Mortlach, the local distillery, after his employment as a clerk at the local Tiniver Lime Works at Crachie came to an abrupt end thanks to a dispute between his two bosses. It was here at Mortlach William he gained an apprenticeship in the art of whisky making and eventually became distillery manager. He spent the next 20 years at the distillery learning about business, learning the craft of distillation and saving a little every month for 20 years. In 1886, William quit his job to follow his dream of establishing his own distillery. With the help of his family, including his wife Elizabeth and their nine children, William established and built, with his own hands, the Glenfiddich Distillery in Dufftown, Speyside. The name Glenfiddich was inspired by the distillery’s location beside the River Fiddich, which is a tributary of the River Spey. The name Glenfiddich in Scots Gaelic translates as Valley of the Deer. The distillery was fitted out with second-hand equipment that William purchased from the Cardow Distillery (now Cardhu), with the final bill for the Glenfiddich distillery coming to a little over £700. No one could have know that six years earlier in 1860, the astral wheels in the story of Hendrick’s Gin would begin to slowly turn with the construction of a small pot copper still crafted by master coppersmiths Bennett, Sons & Shears in London. On Christmas day 1887, the distillery began production of its first single malt. It a was a big risk to produce a single malt at the time as predominantly blended brands were more common, cheaper to produce and more popular. But this didn’t deter William as he and his family focused on producing the best possible single malt, “the best dram in the glen” as he would say. His belief and determination was rewarded in 1892 when the Glenfiddich whisky proved so popular it resulted in the construction of a second distillery next door to the original in Dufftown, the Balvenie Distillery. In 1898, alongside Glenfiddich, William introduced Grant’s Whisky, a blended whisky, a bold move considering Scotland’s largest Whisky blender of the time had folded. 1904 saw William’s son John set sail to Canada and in the same year he established the business’ first agencies in both Canada and the USA. In 1909, William’s new son-in-law, Charles Gordon, was given a sales position within the company, which saw Charles travel the world looking for opportunities to export. It wasn’t until Charles 181st meeting that he secured an order, an order that came from his very first meeting! In just five years, Charles had helped establish distribution networks in 30 countries, no small feat when journeys to the Far East meant months travelling by boat, a slow means of transport at the time. 1914 saw the start of World War 1 and a change in Government attitudes and increased intervention in whisky production. In 1915, the Immature Spirits Act was introduced, which meant, by law, whiskies had to be aged for at least two years and in 1916 this was increased to three years. In 1917, the introduction of a minimum 40% vol requirement for whisky was also introduced. Grain shipments to the UK were also severely hampered by the sinking of supply vessels from Europe leading to shortages in vital supplies and, partly due to the difficulties of dangerous sea transport, America and Canada banned whisky imports. It was too much for the business to bear and in 1917 the distillery was forced to close its doors. The 1918 budget doubled duty on whisky and introduced a fixed price. This led to the consumption of whisky falling dramatically. Distilleries played a vital role in the war effort by creating yeast for bread making and chemicals and materials for munitions. They created industrial alcohol that was used for medicines and some alcohols and solvents were used in clothing manufacturing for the Navy and Army. Wooden crates, packaging, boats and more were being manufactured across the UK in the many cooperages. Many whisky producing regions saw young men leave to fight in the great war and never return, a loss that impacted many small communities and the whisky distilleries that had sprung up around these towns and villages. From over 130 distillers in production at the start of 1914, by the end of the war five years later, there were only a handful of patent still (column still) distilleries left. It was a tough period for the industry but William Grant & Sons, thanks in part to sound financial planning and stewardship of the business by level headed management, were one of the few Scottish based distilleries to make it through this time and reopen their doors in 1919. 1919 also saw the introduction of American Prohibition, which made the sale or production of alcohol in America illegal. It was around this time that Williams Grant’s grandson William Grant Gordon joined the family business. To the surprise of many, he ordered an increase in whisky production, something that some in the industry saw as a wild and reckless move. On the 5th of January 1923, William Grant, founder of William Grant & Sons, passed away at the age of 84 at his home in Dufftown leaving behind a legacy and a business that was in safe, family hands. It’s said that at his funeral William was remembered for his liveliness, his generosity and his legendary sense of humour. When Prohibition came to an end in America in 1933, there were just six distilleries still operating in Scotland, but thanks to William Grant Gordon’s vision, foresight and brave approach, the business was in a very strong position by the end of the Prohibition era. Over the next two decades, William Grant & Sons continued to grow and innovative, briefly stopping production during World War 2 when barley was used for food production only. 1956 saw the radical introduction of a new triangular bottle for Grant’s Blended Whisky, inspired by the whisky trinity of water, air and barley. Designed by Hans Schleger, the bottle was not only distinctive and elegant, it showcased the colour of the whisky. It also meant that the bottles could be stacked and packed more efficiently. In 1957, Charles Gordon along with his brother Sandy, the sons of William Grant Gordon and William Grant’s great-grandsons, brought coppersmiths onsite to help build and tend to the copper stills. An onsite cooperage was established in 1959, which meant casks could be built and repaired on site. 1962 was the year a fresh faced stock clerk by the name of David Stewart joined William Grant & Sons at their The Balvenie Distillery. He quickly moved onto become an apprentice blender before eventually becoming the official Malt Master in 1974. This is a position David still holds to this day, making him the longest serving Master Blender and Malt Master in the industry. In 1963 William Grant & Sons, thanks to Charles Gordon’s ambition and belief in the quality of whisky, shook up the way whisky was being promoted. Charles had introduced the idea of promoting the Glenfiddich Single Malt outside of the UK for the first time, to engage and promote the virtues of the Single Malt over blended whisky. Up until that point, consumers around the world were used to drinking blended whisky, effectively breaking new ground for not only William Grant & Sons but the Scottish Whisky industry. Through a number of brave advertising campaigns initiated by Charles across America, demand for Glenfiddich increased. Its single malt heritage, Scottish roots and provenance proved a hit in America and other international territories soon followed. Another milestone in the year of 1963 saw Charles Gordon, the son of Grant Gordon and William Grant’s great-grandson, purchase a former munitions factory in Girvan, a small seaside village on the south-west coast of Scotland. The site at Girvan, which eventually became known as the Girvan Grain Distillery, started producing grain whisky for use in the blended whisky brands being produced by William Grant & Sons at the time. Being able to house and manage its own grain provided extra stability and self-sufficiency. The site at Girvan would also one day become home to Hendrick’s Gin. In 1966, the astral wheels of fate continued to slowly turn when Charles Gordon, who had been made the honorary Life President of William Grant & Sons, found himself at auction bidding on two very rare copper pot stills. Faced with a once in a lifetime opportunity to purchase the stills, Charles didn’t miss a beat. He left the auction room that day the proud owner of the two stills that would one day be used to make Hendrick’s Gin. A Carter-Head Still made by John Dore & Co., which had been built in 1948, of which only a handful were made and a small Bennett, Sons & Shears copper pot still, dating back to 1860. This still had originally been housed in East London at the Marshall Taplow Distillery, a gin rectifier and a blender and bottler of spirits. With his bids successful and the stills down into individual parts for delivery, there was just one question – what to do with them? 1974 saw William Grant & Sons awarded the Queen’s Award to Industry for Export Achievement, a ceremony that was attended by Janet Sheed Roberts, William Grant’s granddaughter and Aunt to Charles and Sandy Gordon. Janet would one day play her own vital part in the story of Hendrick’s Gin. By 1977 the stills Charles had purchased over a decade before had been refurbished and commissioned at the Girvan site. At the time the popularity of gin was on the rise and Charles had the perfect stills for the job. Grant’s Special Dry Gin was launched and came in the same triangular bottle shape that was used for Grant’s blended whisky. Unfortunately by the early 1980’s there were a number of gins on the market and it proved difficult for Grant’s to stand out amongst a sea of London Drys. With a growing range of gins available to the consumer, Charles realised that for their gin to stand out, they would have to do something truly unique, something different, something unexpected and excellent. By 1988, Charles Gordon focused his attentions on what to do with the stills he had purchased almost 22 years earlier. William Grant & Sons had earned its reputation and industry respect as a distiller and producer of the finest Scottish spirits. But Charles knew there was still an opportunity to create a truly great Scottish Gin when the time was right. He knew William Grant & Sons not only had the equipment in the form of the stills, which he knew in the right hands, with the right recipe could be used to create something wonderful. At the same time, a young chemist by the name of Lesley Gracie, joined the liquid development team at Girvan from Yorkshire. She was tasked with working on products like Balvenie and Glenfiddich. Lesley had joined William Grant & Sons with a chemistry degree from London’s Royal Society of Chemistry. In her previous job for a pharmaceutical company, she had worked on the development of pain relief drugs that were being developed to help treat people with severe arthritis. Part of her job there was to make the new medicines taste palatable. It’s rumoured that from an early age, Lesley’s love of nature and botanicals often saw friends and family offered a cup of twig tea or a nice cold glass of grass juice. Cucumbers and roses aren’t your typical gin botanicals so how did this unlikely combination reminiscent of a summers day in a garden come to be? Well it was just that. David Stewart, the Master Blender, had been a secret gin aficionado. One fine summer day in the mid-90’s, whilst sitting enjoying a gin apéritif in his garden, David had the idea for a new Scottish Gin. Tucking into his cucumber sandwiches and admiring his roses, David pondered what would a gin featuring cucumber and roses taste like? The next day he suggested the idea of creating a truly unique Scottish Gin that would be unlike anything else that had come before. Over the next few years, alongside master distiller David Stewart, Lesley explored different flavour profiles in conjunction with the Scotch Whisky Research Institute. It was David’s idea of cucumber sandwiches in the garden that shaped and inspired the final flavour profile for Hendrick’s Gin. The unique flavour combination took approximately twenty one distillations to perfect before Lesley and David created and agreed upon on the recipe in 1998, before Hendrick’s Gin was officially ready for launch in 2000 to the American market. Because Hendrick’s was distilled using a unique method, it couldn’t be called a London Dry Gin, which in a way suited the style of the gin. Hendrick’s gin was born to be unusual, anything but expected. Hendrick’s Gin is created using two separate distillations that are blended to create the right balance. The Carter-Head still is used to distill the lighter, floral distillate while the smaller Bennett, Sons & Shears copper pot still is used to capture the juniper spirit. Both distillations are then carefully blended with the addition of cucumber and Bulgarian rose petal essences before being cut with water and bottled. To this day, there are only four people who know the specific method and recipe of the 11 different botanicals that go into making Hendrick’s Gin. The recipe was honed and perfected but there was still something missing – a name. Remember Janet Sheed Roberts? Not only was she William Grant’s granddaughter, but she also came up with the Hendrick’s name. Although Janet wasn’t directly involved in the running of William Grant & Sons, she played a vital role as a brand ambassador for the business. It’s said that Janet’s gardener at her home in Dufftown was referred to as Hendrick. It was such an unusual name that it always stuck with Janet. When William Grant & Sons were exploring names, Janet suggested the name of her gardener, as it was in keeping with the idea of the new gin, capturing the spirit of sitting in a lovely, floral garden enjoying a cucumber sandwich. She was a central figure in the Grant family and her contribution to the business was recognised with the unveiling of one of Glenfiddich’s rarest ever vintages, the 55yo Janet Sheed Roberts Reserve. Only 11 bottles of the malt have been produced – one for each decade of Janet’s life – and each is being auctioned to raise money for good causes. She passed away peacefully in 2012 at the age of 110, the oldest women in Scotland at the time. Once launched, Hendrick’s Gin quickly became a revelation; a gin that was served with with a slice of cucumber. It wasn’t a London Dry but was unmistakably gin. It captured the eye and imagination of the consumer. Not only was the flavour profile a talking point, but the look and branding was evocative of Victorian Apothecary jars and bottles. It was unlike anything else available in the premium craft gin category and is often credited as the founding father of the current gin renaissance. A gin that challenged the perception of what gin was, how it should taste and be served, and even how a gin bottle could look. How Hendrick’s Gin was promoted and marketed was also unlike anything that had gone before. Hot air balloons, motorbikes and side cars, buses, trams, curious cupboards, cucumber day and more. The marketing of Hendrick’s mixed fun and obscure together to create a visual language that over time became instantly recognisable as part of the brand. Part Monty-Python in terms of illustrative style but always true to the Hendrick’s Gin ethos ‘A most unusual gin’, but always proud of its Scottish heritage, as evident on the bottle, which states ‘Distilled & Bottled in Scotland’. Also, as a nod to its own forefather, you’ll find ‘Est. 1886’ on the bottle – the very year William Grant established William Grant & Sons in Speyside, Scotland. It would be another 3 years before Hendrick’s Gin was officially launched in the UK in 2003. By the time Hendrick’s Gin launched in the UK, it had already picked up some pretty impressive accolades, including the The Wall Street Journal describing Hendrick’s as the “Best Gin in the World”. Hendrick’s Gin would eventually go on to win a variety of awards, including two double gold, two gold and three silver medals at The San Francisco World Spirits Competition between 2005 and 2012. As the demand for gin continued to grow, so did the story of Hendrick’s Gin. 2008 saw Hendrick’s Gin exceed sales of 100,000 cases. By 2012, global sales were 364,000 cases and saw Hendrick’s Gin available in over 70 countries. Although the sales continued to grow, Hendrick’s Gin never compromised on the contents of the bottle. Up until 2018, every single drop of Hendrick’s Gin had been produced at the Hendrick’s Gin Palace, a small red brick building that housed the stills and Lesley’s workshop, in Girvan. For the first 11 years of its life, Hendrick’s Gin was made by one still-man, Alan Rimmer, who produced over 6 million litres of Hendrick’s Gin – single handedly. After 4 years in development, Hendrick’s released Quinetum in 2013, a quinine cordial that was created specifically for bartenders to aid them in the creation of cocktails. The cordial was created by Lesley and only available in two dozen hand-picked bars across America. The recipe was inspired by Thomas Whiffen, a pioneering mathematician and chemist in the 19th century, whose research involved the use of quinine. 2013 was also the year Lesley found herself on a botanical expedition to Venezuela. It was an adventure that saw Lesley explore the landscapes of Venezuela including the Guayana Highlands, the savannahs, rainforests, mountains, deep jungle and more. A true adventure in pursuit of new botanical wonders. Lesley was in the company of Mr. Charles Brewer-Carias, a world renowned explorer and Francisco Delascio, a highly respected botanist. With a love of nature and plants, it was the perfect excuse to bring along a small copper pot still and distil some of the local plants to see which oils and flavour compounds could be extracted. Lesley foraged, crushed, smelt, distilled and experimented with a variety of botanicals. She recorded the findings and bottled the distillations. Scorpion’s Tail was one of the botanicals that retained its floral and spice traits when distilled. Once back in the UK, the Scorpion’s Tail distillate was used to create a very limited edition, Hendrick’s Kanaracuni Gin, which was produced in a run of only 350 litres with some bottles given out to the people who had been supportive of the brand from the beginning. Events were arranged and guests were encouraged to make their own cocktails with the new gin or enjoy it anyway they liked, but they weren’t allowed to take it home. 2017 saw the release of Hendrick’s Orbium Gin, which was launched initially as a limited edition expression. Partly inspired by earlier experimentations with quinine and the release of Quinetum, this new gin was created using the base of Hendrick’s Gin with the addition of Quinine, Wormwood and Blue Lotus Blossom extracts. Lesley took these additional favours, that were traditionally associated with gin in their own right, and did something completely new. Quinine is usually found in tonic water and wormwood forms the base of a key ingredient found in the classic martini cocktail – Vermouth. The colour and mystery of the Blue Lotus flower shaped the final dark blue colour of the bottle. Lesley came up with the name Orbium based on the liquid’s journey. Orbium derives from the word ‘orb’, the plural of Orbis and the Latin for circle, a reflection of the rounded, balanced flavour profile of her newest Hendrick’s Gin expression. 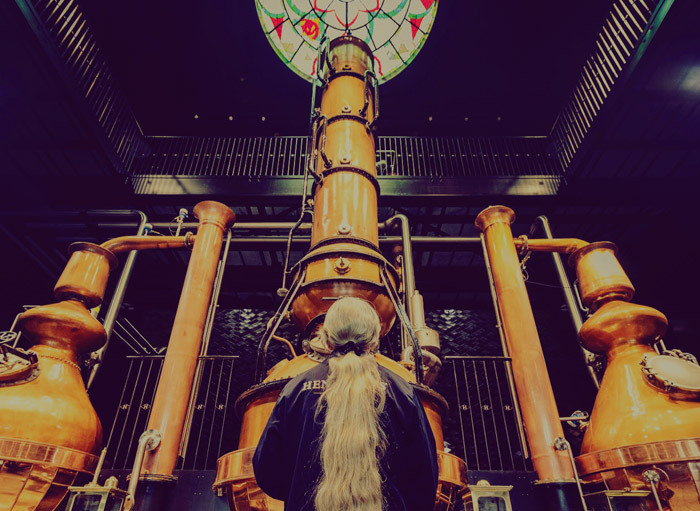 2018 saw the team at Hendrick’s officially unveil their brand new, bespoke Hendrick’s Gin Palace, housed at the Girvan site where Lesley, now Master Distiller, and her team still oversee the distillation. This includes checking the quality of every batch produced, ensuring consistency and quality and flavour of the gin, which is still produced in small batches of 500. Featuring two still-houses, now home to six stills, comprising four Bennett stills, including the original antique copper pot still from 1860, plus three exact replicas; and two Carter-Head stills, including the original that dates back to 1948, and one exact replica. That’s a lot of copper! The new stills will allow Lesley to double production whilst using the same traditional methods. In honour of Alan Rimmer’s 11 years as the still-man, who predominately was in charge of the distillation of Hendrick’s Gin, you’ll find the Bennet still in ‘Still House 2’, aptly named Alan Rimmer. The new gin palace also houses a laboratory for experimentation and innovation, two green houses that will be used to grow plants and botanicals for use in future gin creations, along with a bar area. The whole purpose of the new Hendrick’s Gin Palace is so much more than the sum of its parts – it will be a place of education, a place to discover, a place to experiment, a place to create. It’s a new home for Hendrick’s gin as we know it and a home for the future expressions of Hendrick’s Gin that are waiting to be discovered by Lesley and her team. 2020 will see Hendrick’s Gin celebrate its 20th anniversary. It’s an indication of the care and love that Lesley and all the team at William Grant & Sons put into creating a Scottish Gin that was true to the ethos of William Grant & Sons – innovative, brave, unique, a gin that captured emotions and captured the imagination. The fascinating story of Hendrick’s Gin may have been a story in the making for over 120 years, but throughout its long journey to get where it is today, Hendrick’s Gin has been shaped by its very own ingredients – curious coincidences, precious people, botanical brilliance, inspirational imagination – always unexpected and never uneventful. Thanks to William Grant & Sons for allowing us exclusive access to their photo archive. You can learn more about Hendrick’s Gin here. You can learn more about Hendrick's Gin by visiting the links below.